Refaced Kitchen Cabinets with Quartz Countertop. Cabinet refacing has become more popular in the last few years, due to the explosion of companies that do nothing else but reface cabinets. Other companies, such as Kitchen Tune-Up, make their bread and butter with refacing projects, but also take on supplemental jobs like bathroom remodeling and wood reconditioning. Given the high cost, it is tempting to try to reface your own cabinets. Veneering is tricky, an exacting process--not a job to take on lightly. Make a mistake with drywall or laminate floor, and replacement materials are cheap and easy to obtain with your next Home Depot run. Make a mistake with wood veneer and it's expensive and requires another online order. And waiting for that order to arrive. 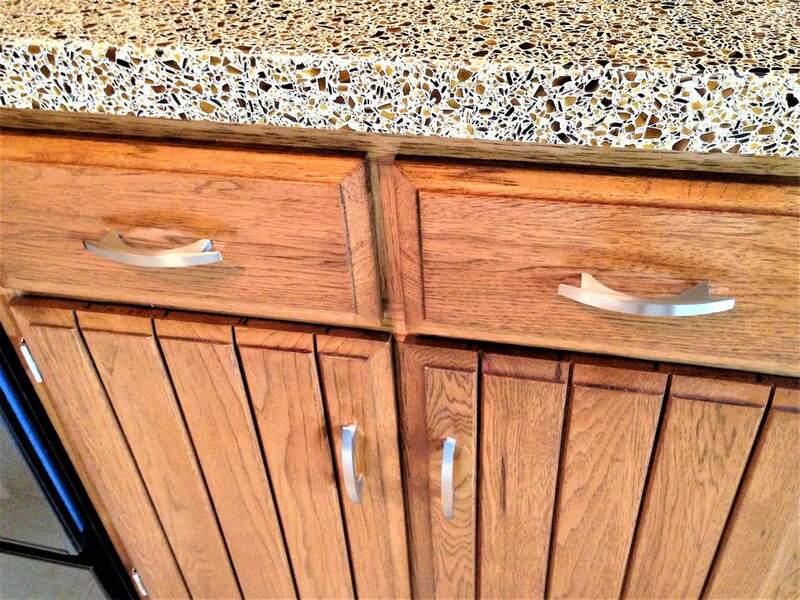 Even hanging cabinet doors--seemingly a cakewalk--is difficult. Resources for do-it-yourself cabinet refacing are few and far between. Order Doors/Fronts: Order new cabinet doors and drawer fronts from a supplier. Companies such as Advantage Cabinet Doors let you order the right size, as well as the desired finish and wood species, for your new cabinet doors. Remove Contents: Take everything out: all plates, bowls, knick-knacks, shelves, etc. Everything goes. Remove Doors/Fronts: Take out all existing cabinet doors and drawer fronts. Remove Cabinet/Drawer Pulls and Knobs: Remove hardware from doors and drawer fronts, if you intend to keep this hardware. If not, don't worry about removal. Junk Yard Run: Dispose of old doors, drawer fronts, and hardware. Sanding: Lightly sand down surfaces that will receive the veneer with fine-grit sandpaper. Cleaning, Part 1: Clean with a tack cloth. Cleaning, Part 2: Thoroughly wipe down all cabinet boxes (frames and all) with TSP. Veneering: Apply wood veneer to cabinet boxes. Rockler Woodworking and Hardware sells pressure-sensitive wood veneer sheets as well as wood veneer edge banding. Re-Install Doors/Fronts: Install new cabinet doors and drawer fronts.